TaylorMade's lineup of M drivers and fairway woods have been wildly successful, as evidenced by the ever-expanding list of tour pros who carry them in their bags. 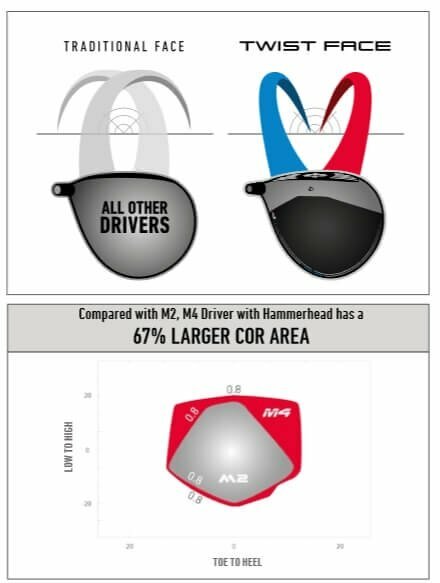 Some of the world's best drivers of the golf ball will be playing the all new TaylorMade M4 Driver and for good reason. The new M4 features a suite of ground breaking technology and revolutionary club designs. The most notable break through is Twist Face. Twist Face is TaylorMade's new corrective face curvature, which helps mishits fly farther and straighter. Twist Face's toe is aimed farther right and lofted up in comparison the center of the face. Conversely, the heel aims farther left and has less loft than the center of the club face. Twist Face actively combats the low-left ball flight on a toe strike and the high-right ball flight of a heel strike. The Geocoustic sole is smaller than it's predcessors, which in turn makes for a larger, more foriving face. The sole is also engineered for a solid and explosive sound. The new M4 is long and straight, but that's a claim every manufacturer makes. TaylorMade and only TaylorMade can say they make a driver that actively corrects mishits. Exellent product at very good price. Outstanding service with fast delivery. Great driver! Easy to hit with more distance.